Join us on April 10th at the L.E. Phillips Memorial Public Library for an evening of surprises, as poet Jennifer L. Knox takes us through a reading and discussion on the surprising nature of poetry. In preparation for this event, we had a chance to gain Knox’s insight into what we should expect from the evening. Lauren Becker: So, we’re going to talk about surprises and poetry. This begs the question - are they pleasant surprises? Or unpleasant? Jennifer L. Knox: Hopefully the surprises will be somewhat pleasant, but I can’t guarantee they’ll all feel like finding a $20 bill in your jeans pocket kind of surprise. Could you give us a bit of a teaser as to what you have planned for the evening? I'm going to read some poems from my books (perhaps even some new ones) and talk about how they surprised me— either by the way the ideas for them entered my brain, in the process of writing them or by the way people responded to them. Some of us who aren’t as familiar with poetry may chalk it up to archaic, melancholy haikus about ponds. You’ve proven time and time again that’s not the case. What are your thoughts on the presence of humor and jarring language in poetry? Poems and poets are as varied as styles of music; we each have a different song in our head. And there are different kinds of humor; I enjoy subverting the expectations of the reader—that's the incongruity theory. It's like hard-wiring surprise into a poem, and one way to accomplish this is to use diction and ideas that people don't ordinarily expect to see in a poem. When most people think poetry, they think of poetic-ness, and beauty and truth and ponds, as you mentioned. They don't necessarily think deep-fried Twinkies or mad cow disease. Using language that surprises helps me create an epiphany for the reader. JK: Every day, Lauren! Generative writing comes from the same spot in the brain as lying, so when we're generating words on the page, nothing's off limits. It's like that game where you stand in the glass box and try to catch the dollar bills blowing around—you'd grab anything that blows by. Editing happens in the same part of the brain as accounting; in this phase, we must imagine the readers receiving our words and empathize with them. Many of us who are just beginning our own long journey of poetic writing may look at your work and ask, what path did you take to get here? I learned to love poetry by writing it. I believe it creates physical sensations in the brain, like exercising. A poem is a puzzle you make that only you can solve. But what has kept me writing poetry is my community of poets and writers, many of whom I met while earning my MFA, but there are others. My poetry people have been my ace in the hole. What do you hope folks take away from this upcoming event? I hope they're excited to write and read more poetry! If this hasn’t enticed you enough, Kathleen Rooney summarizes why we so desperately need the artistic work and insight of individuals such as Knox, now more than ever. Check out Knox’s latest book, Days of Shame and Failure, here! 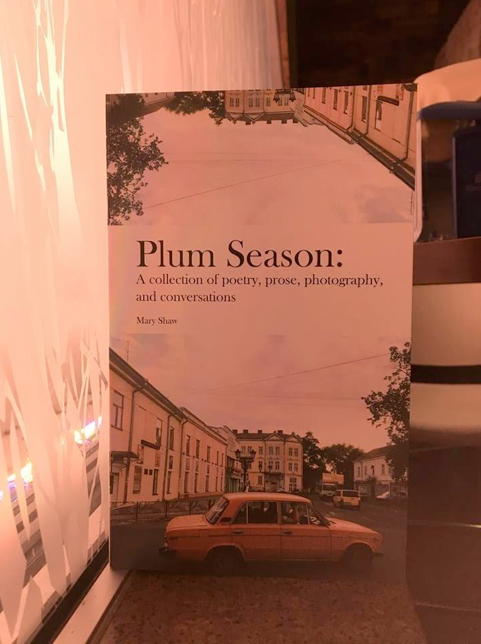 Mary Shaw reflects on time that she spent with her family in Ukraine in her collection, Plum Season: A collection of poetry, prose, photography, and conversations. It was released on December 8th at Dotters Books; she read her book to a warm room full of love and eager ears. Shaw is majoring in critical studies in literature, culture, and film at the University of Wisconsin-Eau Claire. In this interview, she recounts her writing process, academic opportunities, how she kept motivation, and what it was like to show her family what she created. CHLOE ACKERMAN: Can you tell me about how you got the opportunity to create and publish this book? MARY SHAW: I got this opportunity through a grant from the school through ORSP, so that means that I will be presenting in the spring at CERCA as well. Dr. Theresa Kemp, who is an English professor here, actually told me about it and convinced me to apply. CA: What was it like writing everything in this and putting together this book? MS: Putting it all together and writing it was fun, obviously. This is something that I had wanted to do for a very long time, but I am very bad with deadlines, so it was stressful in a way. Also, my self-consciousness would come in sometimes and be like, “this is not good enough,” so I learned a lot about moving forward and pushing even when I felt like it was difficult to keep writing. CA: Did you write a lot of Plum Season before you knew you had the grant to write the collection? MS: Yes, I did. Most of the poems I had written either in Ukraine or immediately once I returned from Ukraine. There are a few things that I wrote extra for this specific collection. Especially the conversations, I went through old interviews I had on my phone and transcribed them, but all the photography was taken in Ukraine. CA: Did you have any kind of process for this while you were writing? MS: I had a very loose process. Again, I’m not good at self-regulating, or keeping myself from going out, and actually staying home and doing it. My process was to sit down for fifteen minutes, and, whether I wrote something and ended up writing longer than 15 minutes or I wrote nothing, at least I sat down for fifteen minutes and tried. Most of the time when I did that, I ended up writing longer, so it was just getting myself into the seat every day for fifteen minutes to do that. CA: Was there anything you learned about yourself while you were there while you were putting this collection together? MS: I learned that I can indeed write okay after a little bit. I learned that I need to push myself if I want to get results, and the outcome is only on me and nobody else. I learned that even once I do write, and I feel that it’s poor, if I keep writing and keep working on it, it does improve. CA: Did it make you look at the time you spent in Ukraine differently? MS: Definitely, I heard some saying a while ago that if you want to write about yourself, don’t write the day after. You need time to process what had gone on and look at it objectively. Looking back after two years and thinking about how I wanted to write this, I definitely thought of my time in a different way. Whatever I was writing, these were the memories that I was going to keep, and these were the memories that would live on. Now that I wrote it down, it would only ever be like that on paper. If I go back to Ukraine tomorrow, it’s not going to be anything like what I wrote. Memories, they keep things alive. CA: What was it like for your family to see the finished product of the book? MS: My dad’s usually a pretty silent guy, but he was very proud. My sister was really giddy. My mom’s funny. I would show her it, and the first thing she would do is be like, “okay I found a mistake”, or she’d be like, “I don’t like this picture, use a different one”, or “I think you used the incorrect grammar there”. But when all was said and done, she was crying at the release, and she cried each time she read it and she was very proud of me. I think they’re all very proud and happy that there is something on paper of our family history. CA: Did you show Plum Season to your mom as you wrote it? MS: Yeah, I showed her my first draft, and then she saw the one at the release party. I didn’t really keep her up-to-date regularly, it was more like I wanted to do it on my own and then show her because I knew she would want to insert herself. I let myself do some things and then let her see it after I already finished. CA: Is there anything else you wanted to share about your book or about this opportunity? MS: I think, just a plug, I didn’t think this would be possible for me to do at my age, and I really encourage any students at the University of Wisconsin-Eau Claire to ask their faculty advisors about grant work and CERCA. Honestly, while you’re here, you might as well go for all of the possibilities that you have at hand. I met with Jo Ellen Burke of 200 Main Gallery, and she told me about her hopes of bringing together Eau Claire’s creative community with their future events. 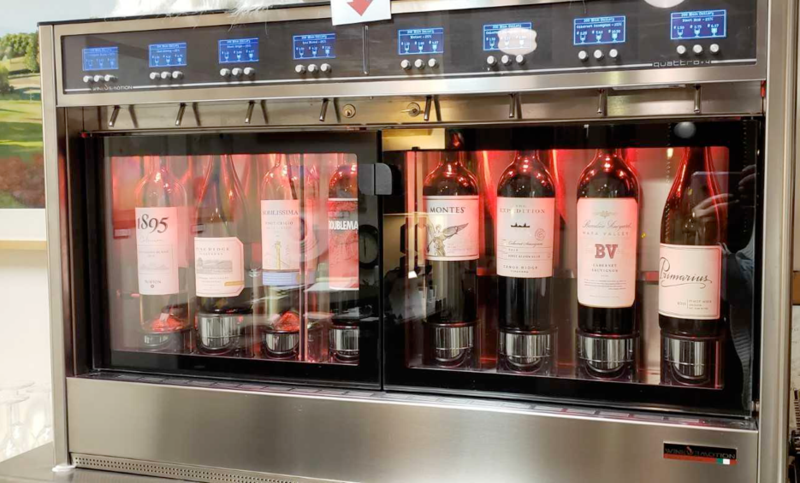 The gallery’s latest attraction is Eau Claire’s first wine dispenser. Gallery patrons can buy wine and hang out before local events, read, write, or meet with friends. As Burke gave me a tour of the gallery, she explained how Eau Claire’s diverse art scene has seen much of its success because of constant collaboration and support from local artists and venues. We also talked about the history of the 200 Main Gallery’s building (200 Main St., Eau Claire), how Eau Claire’s art culture has developed over time and the gallery’s new series of literary events focusing on local women writers. Join us on our virtual tour! JO ELLEN BURKE: Often people will just come in and work. They’ll work on their computer or read at the bar. During the week we are open Wednesday through Saturday noon to ten or eleven depending on what’s going on. As I show you around, you can see, we have a lounge area with some merchandise for sale, but it’s also a meeting room for book groups or writer’s groups. It can fit about eight or ten people. We really like the privacy of this room; it’s kind of a cozier spot. You might like the idea that the whole place used to be a book bindery, so as a book bindery they kept their paperwork in a vault instead of a bank. Paper was precious; there was no way to back books up in terms of a computer, so they treated it as a very valuable source. Now the book bindery’s vault is where we keep our wine. CHLOE ACKERMAN: Is a lot of the art throughout the gallery by local artists? JB: It’s pretty much local artists except for just a few. 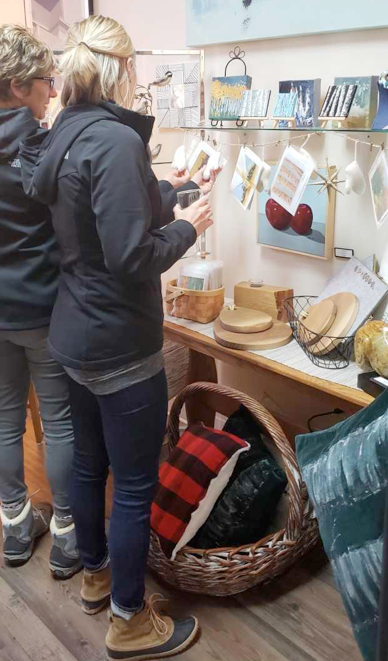 There’s a sculptor from Wausau, and we have a ceramic art teacher from Sturgeon Bay, and then we have another ceramic artist from Lake Geneva, and the rest are pretty much from Eau Claire. I do a lot of textile work, so I do the mirrors and napkins, and I like painting on textiles, so that’s a lot of what I do along with some painting. A lot of the work around here is from Terry, who’s my partner and is a sculptor and a painter. Terry sculpts a lot of horses; you’ve probably seen them at the Oxbow. He did the big tall steel horses that were downtown for a while, they called it Tres Caballos. Could you tell me what types of events you hold that bring together different facets of the local art scene, and about the upcoming events? JB: We will have writers and authors. We are also going to have demonstrations. For example, Terry does live painting, and we auction off what he’s painted. So you can come and watch him; he’s very comfortable painting in front of people. We’ve had two musicians here. We like to have live music and collaborate with the area musicians. We had Robin Mink on guitar, and we had Julie Majkowski on flute. We really like the ambiance that that’s created for the arts through music as well. Our only restriction is space, but it’s a cozy atmosphere; people feel comfortable here. In January or February, we are going to launch what we’re calling 200 Main Mobile, and that’s a means of getting artwork out to the public and to public businesses and nonprofits. 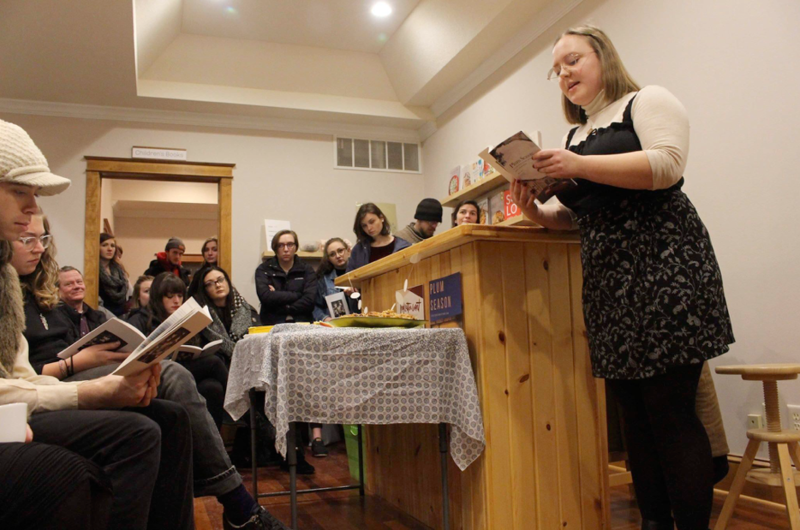 Why did you choose to host events highlighting local women writers? JB: One of the big things that we believe in is an array of art. We believe in music, theater, writers, and others, and we know we have so many great authors in town. As we talked about writers, we saw many events that were highlighting the great writers in our area, but we didn’t see too many that focused on women. I felt it was timely, and it is a nice opportunity to focus on women writers. We decided that, on the first Wednesday of every month, we’d host something called Women Writers on Wednesday. Now, we’re thinking we should probably do it more than once a month because there are so many great writers, but we’ll just start with every month for now. The first natural choice was Cathy Sultan. She is so knowledgeable and articulate. She writes beautifully, and she has this expertise in the Middle East that is really instructive. She was here on the 5th of December. We ended up selling out the first day; we filled thirty seats with free tickets. In January, we’ll have Patti See. Then in February, we will have Molly Patterson, and we are eager to have her and get to know her a little better. In March, we are going to have Jan Carroll, and we have others that we are reaching out to. There is such a great writers community in this town. People really support each other, people like BJ Hollars, he’s a wonderful person and I think he’s done a great job collaborating with writers and bringing some light to the talents that we have here. 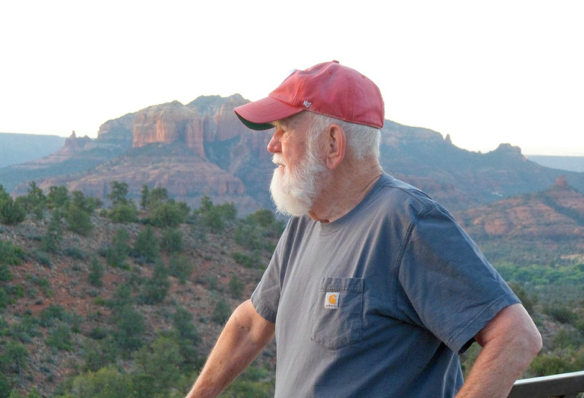 The Pablo Center has done wonderful things for writers, too. We want to really support and continue that kind of momentum. There’s this wave in the creative economy here. I think it’s less of a wave, and it’s embedded in our culture now in a way that is very positive and strong. CA: I grew up in Eau Claire, and I can tell that the art scene has definitely grown since I was younger. JB: Yeah, it’s such a different city. You might remember just five to eight years ago, you’d go downtown and there was nothing going on. Now, thanks to Volume One and other investors like Zach Halmstad, it’s really made a difference. Not to get too philosophical, but our community has embraced the arts so well, and I think the momentum for the arts has just really carried on. The factors in the creative economy are somewhat like silos. I think that theater is a silo, music is a silo, the fine arts are a silo, and writing is a silo. I think if we can do a little more collaboration and meshing of those, it creates a better and more fluid art scene. I am hoping that we can be a part of that and show the respect that we all want for the other disciplines of the other types of art, so it’s a win-win. Under the pen name, Max Howard, City Council member Dr. Emily Anderson wrote her novel Fifteen and Change. This book follows a boy named Zeke, who works at a pizzeria and chooses to join the fight to raise the minimum wage. I had the opportunity to sit down with Anderson and talk to her about her new book. Anderson described how the topic of having a living wage is significant to her life and experiences, how she wrote the book in several forms, including villanelles, and how it is difficult to identify genre while creating literature. To celebrate her book, on December 19th, Emily Anderson will be having a book reading, with pizza, at The Plus on Barstow Street in Downtown Eau Claire. CHLOE ACKERMAN: What made you want to write the book Fifteen and Change? EMILY ANDERSON: It’s directly personal to me because I’m a writer and also an academic. Right now, I have a Ph.D., I can get a job, it just won’t be a living wage job. I was involved with a fight for living wages for graduate students and adjunct professors while I was in Buffalo, New York getting my Ph.D., so that was a personal fight. One of the advantages of that fight, or one of the things that I drew strength from, was that we were also coordinated with a Fight for 15 Movement. We were protesting in solidarity with fast food workers and others in the service industry, and that was really great to be a part of that broader labor struggle, so I was kind of carrying that in my mind. The second thing is the knowledge that 43% of kids in Eau Claire schools now are in the ALICE statistics, which stands for Asset Limited, Income Constrained, Employed. Basically, low income affects 43% of Eau Claire residences, and that’s so many children in our schools. Many kids are in a position much like the character Zeke in my novel who are really struggling with all the problems that economic inequality can create. I wanted to write something that reflected what is a really common experience that gets treated as a very unusual or special experience. The overarching structure of the series that the book is a part of is on social issues, and that is the one I felt I had the most personal connection to. In addition to other forms, This book makes use of the villanelle, which are 19-line poems. How did you go about writing this book within such confines? For me, writing is easier when there are some limits or some constraints. Each little poem is about 50 words, and I had to do exactly 192. I kind of had a sense of what should happen every 20 poems or so to add a movement or pace to the narrative. I mapped that out and then went in and put those smaller pieces together, so it made structuring the narrative really easy, which was great. I write prose fiction as well, and I feel like I learned a lot about saving myself some time by knowing how many words something should be. I normally work more organically so having an imposed structure helped a lot. Do you see any crossover between your work as a council member and your writing? So much. I am motivated by the same concerns of wanting to make the world a fairer place and wanting to do my best to amplify the voices of people that are fighting for equality. So that’s definitely a motivation that I share, but I also think that the work of writing is actually really similar to politics. One thing I think of a lot is, the poet, Percy Shelley, who called poets, “the unacknowledged legislators of the world” because it’s creativity that breathes life into an idea and once an idea has life, or momentum, or energy, it captures people’s imaginations that’s what it takes to change the world. I think you see that a lot in politics, for good or ill, that people use language in imaginative ways, and it captures people’s hearts. This stuff happens whether it’s good or it’s bad. It’s a real power. Is there a person or something that has influenced you a lot in your writing or in your work? I think I wouldn’t have been able to continue being a writer if I didn’t have amazing teachers, friends, and family members that are always encouraging me and supporting me. I think I have been really lucky with the kinds of relationships I have in my life, and I don’t think that I would be able to persist in a rejection heavy career if I didn’t have people that have my back. One of the things that I try to emphasize in the book is that when Zeke becomes more directly active politically, it’s because he loves the people around him. It’s something that he does with a spirit of both love and also playfulness, and it’s this idea that getting involved and making change happen can be something that is playful and happy. It has to do with love and good feelings and not just like some abstract principle, and it can be a baby step and not necessarily a big step to make a difference. What question would you like to be asked that gets at the core of you as a writer and/or your writing? One thing I’m thinking about a lot as a writer these days is the question of form or genre. I never know when I start a project what the form or genre is going to be. That’s something I learn as the ideas form and come together. I feel like people ask, “What do you write? Do you write fiction? Or do you write poetry?” And I always have a hard time answering that question, because I don’t know what something is until I am done making it, and even then sometimes I don’t really know exactly what it is. I think form communicates with content in a way that makes the genre a challenging thing to pin down. Yes! I have a book party on the 19th of December, and anyone can come. It is going to be at The Plus at 7:00pm, and there is going to be pizza because my book is about pizza. Librarians open doors and create portals to thousands of possible worlds. Rob Reid has worked much of his life to show to young kids that libraries are fun places. When he worked as a librarian he toured libraries and performed raps that he wrote using the names of children’s books. Now he’s a professor at the University of Wisconsin-Eau Claire where he teaches how to use children’s literature to future educators. 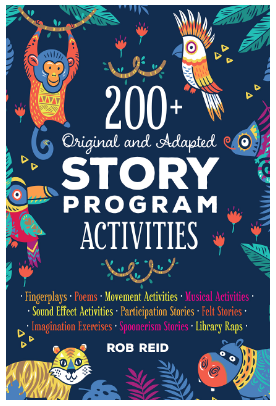 Rob Reid explains his process and motivation for writing the songs, activities, and musical activities for his new book, 200+ Original and Adapted Story Program Activities, in this interview. CHLOE ACKERMAN: What has had the most influence on you as a writer? ROB REID: I have always been a writer but not always a published writer, and I found that my published niche was writing for my peers. Before I came to the university where I teach children’s literature, I was a children’s librarian in public libraries both here in Eau Claire and in Pueblo, Colorado. I came up with a lot of original ideas to kind of encourage kids to come to the library and hopefully make them lifelong book lovers. Then I found out that my peers were really interested in what I was doing. Then I made a connection with the American Library Association. They have a publishing arm called ALA Editions and they bought my book Children’s Jukebox which was a subject index of children’s recorded music. So if a daycare worker came in and said they want a song about friendship or frogs there wasn’t any research tool like that out there. I listened to about 200 children’s recordings and divided up the subject headings. I found the publisher then when that book was published they said, “what do you want to do next?” Which is something you want to hear an editor say. Then I was doing multigenerational story programs for grandma and grandpa or mom and dad and the kids and we called it family story time. That was the second one. I was lucky to find that publisher because then they kept saying what’s your next idea and so I have published 13 books with the ALA. This is my 20th book overall and 13th with them. The marketing editor and I are calling it the lucky thirteen. I basically pitch an idea to an editor, they say let’s go with it, then we set up a deadline that looms over my head for a year. I don’t write well without a deadline, and sometimes I do other kinds of writings too, so I do my own little deadlines. I find that kind of crucial for me, and it helps to be in a teaching environment as well because you have deadlines all the time. It helped my writing to quit the library field and come over here to UWEC because I used to work a nine to five job. I had four kids at home, they are all grown up now, and once everybody was done eating and in bed, I would try to write at night and I was exhausted. Over here at the university, I can have an early morning class, a mid-afternoon class, and in between grading and meeting with students I’m still fresh, and I have an hour or two to write. So that is helpful. What is your process for writing the songs, dances, story programs, and activities that go into your books? I sit in a chair and a lot of the material comes because I want to match an activity with a particular children’s book. This is what librarians do with story programs and then follow it up with a finger play, musical activity, or a movement activity. You probably grew up knowing “The Wheels on the Bus” and “We’re Going on a Bear Hunt” and I got tired going on a bus or going on a bear hunt over and over, so I started “We’re Going on an Elephant Hunt” and it created that new version of that old thing or instead of the wheels on the bus it’s “The Wheels on the Sports Car”. It’s not all just adaptation, it’s a lot of original stuff too. I’ll have a picture book in mind, and I’ll think back and I go “what would be a fun activity to do with it?” I like to fill up a legal pad with just broad ideas, then put them together, go to the computer, and take different verses that work well together then read or sing them aloud. It takes several passes before I finally have something. Then I like to test it on somebody besides myself. When my kids were little they were around so I could test it out on them. My wife is, unfortunately, the person now. As I say, in one of my books I get as much satisfaction coming up with a little four-line poem as I do with a 50,000-word book. A lot of it is poetry, it’s almost all poetry if you boil it down. I get a lot of inspiration from camp songs and things like that. I do a lot of audience participation stories where the kids make sound effects to an original story. A lot of it is just sitting back in a chair and just having a pen and a paper and just starting to scrawl stuff. Are there any lessons that you hope the teachers, librarians, parents, and kids who use your programs and activities will take away from this book? The main thing is that the library is a fun place to go. I did a lot of outreach as a librarian with these activities and stories. I would get in front of groups of kids, and if nothing else if they see me and say, “hey, there’s that guy from the library,” and tell their parents, “let’s go down to the library.” You try to make lifelong library users, and, I’ve written about this in Volume One, libraries are as relevant today as they have ever been despite everybody thinking the internet’s here, we don’t need it. You know the L. E. Phillips Memorial Library had 400,000 people go through their doors last year. Almost half a million people, so don’t tell me the library is not relevant. Why do you want to write this book specifically? I used to have a contract with Library Sparks Magazine where in every issue I would have an article, like a lesson plan for Story Time, and I would always like to have original stuff in there. Then the magazine went out of business, and I’m kind of at the age now where I don’t write like this as much anymore; I have other writing projects that I am putting my energy into. So I realized that some of the older books that are 25 years old or so, they’re not necessarily out of print, but people aren’t buying them as much now. This would be kind of fun to pull all that material that people might not have access to anymore and put it in one place, kind of like a one-stop shop 200+ ideas for mostly a children’s librarian, or it could be a parent or a teacher to use with kids. We collected them all together. Like here I have a bunch of “Hello” activities divided up into different themes “animal”, “my world”, and “the literary world”, that’s where I put the library raps. We have some spoonerism stories, that’s where you take parts of words and flip them around so I have some original ones of those. Instead of telling the story of “Little Red Riding Hood”, I tell it as “Little Rude Riding Head” and throughout the story, it’s “Once a time upon there was a gritty little pearl named Little Rude Riding Head…” then the kids try to decipher it. Then there are some “Goodbye” activities too, and I have a picture book called Wave Goodbye that’s based on a poem, “Wave high, wave low, I think it’s time, we gotta go. Wave your elbows, wave your toes, wave your arms, wave your nose…” That kind of stuff. We reprinted the lyrics of that in here, too. The idea was that rock star’s have greatest hits albums, so that’s like my greatest hits album. People will probably gawk at the price a little bit. It’s a pricey book because ALA Editions is a publisher geared towards institutions versus individuals. So schools buy it, libraries buy it, you can get it right now through ALA Editions Publisher, I just checked Amazon they don’t have a price listed yet, but they will have it up there soon. If you gawk at the price, then that’s understandable, it’s $50, but it’s a lifetime’s worth of material especially if you are working with young children. The Chippewa Valley Book Festival began on Monday, October 15th and goes through Thursday, October 25th, spreading literary events across the Chippewa Valley. The festival’s lineup includes a variety of events like writing workshops, dinner discussions, events for children, and much more, so there is something for everyone! I had the chance to sit down with Mildred Larson, a co-chair of the festival, who has been with the Chippewa Valley Book Festival since the very beginning. We talked about how it has grown over the years and what she is looking forward to in this year’s festival. CHLOE ACKERMAN: How did the book festival start? MILDRED LARSON: The book festival started out as a partnership between the L. E. Phillips Memorial Library and the Eau Claire Regional Arts Center 19 years ago. I was working at the public library, we had a grant from the American Library Association for a series of authors and discussions, and we needed a co-sponsor separate from the library. We found the Literary Arts Committee from the Eau Claire Regional Arts Center. Their representative was Karen Loeb, now a retired UWEC English department faculty member, so she and I did that grant. It just seemed to work well, and I think that’s how it got started. We were able to get a few more grants to bring more authors in so obviously it wasn’t the size of the current festival. At first, it was called The Festival of the Turning Leaves. I think people didn’t quite get the pun of turning pages in a book and fall, so that was kind of lost. We decided to change the name to something more obvious, and it became the Chippewa Valley Book Festival. Many people have helped with the festival over the years, but the UWEC English department has been very helpful all along. Nadine St. Louis, who has passed away, was an English professor and poet and one of the first chairs of the book festival committees. After she passed away, we started to have a memorial poetry reading at the festival in Nadine’s honor at the Unitarian Universalist Congregation. The theme of this year’s reading is called Words Without Borders: A Celebration of Poetry in Transition. It’s at 4:00 p.m. on Friday, October 19th. How has the Chippewa Valley Book Festival grown since it began in 2000? It’s grown in a lot of different ways; we have expanded the number of days, and we’ve expanded to include more locations. This year, we have programs in five public libraries: the Eau Claire Public Library, and then also in Menominee, Chippewa Falls, Altoona, and Fall Creek. We’ve tried various locations around town, for example, we have had programs for several years at the Unitarian Universalist Congregation. We have programs on university campuses, and this year for the first time we have a program at UW-Stout. We’ve also added different kinds of events, such as writing workshops and a theatre event. The biggest addition has been authors in the public schools. We have ten authors coming to public schools in Eau Claire, Menominee, and Mondovi so it varies each year. It’s a wonderful experience for the kids. We have writing workshops for children and a Young Writers Showcase. For the showcase, young writers submit writing to be selected by English honors students at UWEC. Those whose work is selected will read at the Grand Theater in Eau Claire on Sunday, October 21st in the afternoon. It's fun and lively, and the children are excited to read to an audience. ﻿What are you most excited for in this year’s Chippewa Valley Book Festival? I am most excited about moving some of our programs into the Pablo Center. Barstow & Grand, David Treuer’s Native Americans and the Imagination, and then the third one at the Pablo Center is Caroline Fraser, author of Prairie Fires: The American Dreams of Laura Ingalls Wilder. David Treuer’s talk will be in the JAMF Theatre, the Barstow & Grand release party will be in one of the rehearsal rooms, I believe, and then the final one, Caroline Fraser, will be in the big RCU Theatre which is a large auditorium. So we will be using three different spaces in the Pablo Center. What kind of connections do the authors in this festival have to the Chippewa Valley? We have local authors and we also have authors coming from Los Angeles, California, Spartanburg, South Carolina, and other faraway locations. This year we have three authors who are regional or local, there is Nickolas Butler who is going to be at UW-Stout, there’s Thomas Pearson who is going to be at the Fall Creek Library talking about frac sand mining, and then Molly Patterson who will be at the Menominee Public Library. Every year we have sort of a mix of local and regional writers and writers from around the country. What do you hope those who attend The Chippewa Valley Book Festival events will take away from them? I mostly hope they enjoy themselves. We look for authors who are going to be exciting presenters and we have scheduled a great range of types of literature and topics, so people should be able to find whatever’s of interest to them. For writers, we hope some of them will be inspired by the writers we bring, and then the people will maybe find some reading they want to follow-up with. Because it’s a long festival, it’s sometimes hard to get all the events out in front of people. I hope people will go to the website and look for more information on the authors and the programs. I hope that they will be coming all the way through October 25th when we have two very excellent programs; there’s Molly Patterson and there’s Heather Swan who is going to be at the Chippewa Falls Public Library. She has a book about honeybees, and it’s a very beautiful looking book. I am certainly hoping that people will continue right through the 25th of October. Writer Cathy Sultan grew up in Washington D.C. where she yearned to know more of the world. In 1969 her wish came true when she met her Lebanese husband and moved with him to Beirut, Lebanon. She quickly fell in love with the city. When the Lebanese Civil War broke out blocks away from their home in 1975, they continued to raise their family in Beirut until it was no longer manageable. Cathy Sultan uses her experience and unique knowledge of the civil war in Lebanon to write her latest book Damascus Street, the sequel to The Syrian. Sandy Tolan, author of Children of the Stone, which was a 2015 L.A. TimesBook of the Year finalist, wrote "Her insights into the region's history and politics go far deeper than your average thriller, exploring U.S. imperial meddling, the heartbreak of Palestinian refugee camps, and the complex and fragile construction of Lebanese society. Damascus Street will stay with you." Damascus Street recounts the story of American physician Andrew Sullivan, whose fiancée is kidnapped by an important Lebanese ex-political figure. This book follows Sullivan’s thrilling mission to get her back. The following is an interview with Cathy Sultan about her latest book. CATHY SULTAN: I think it is my ability to imagine the impossible. After all, I am writing about the Middle East, and particularly Lebanon, which I know intimately, and where skullduggery is an everyday occurrence. This book includes many specific dates and historical events that took place in the Middle East; what kind of research was involved while writing this book? I am a news junkie and so I read extensively about events as they unfold across the Middle East. Most of the research in the book is first-hand knowledge and other than fact-checking on some events and dates, I needed little research. Some of the events in the book, like the explosion that took the life of an important intelligence chief, happened a block from my apartment. Our building shook and I was there to cover it first-hand as the aftermath was reported. He was such a colorful, shady, and important figure with four different passports, and once the rumors began flying about who he actually was and what he did, I began collecting any and all articles I could get my hands on, assuming I would get to use it in some future work. When I got to that part of Damascus Street, I knew it was the right moment to get out my notes and reconstruct his assassination, the details of which, without much invention on my part, were true. Are there any challenges you face as both a fiction and a nonfiction writer? Other than accepting the challenge from my editor to take on fiction, I have not faced many challenges. Writing fiction is actually more fun. No footnotes, no intense fact-checking and I get to use my imagination, which works overtime, due, no doubt, to the exciting life I have had the privilege of living. I don't rule out returning to nonfiction, particularly if Lebanon is attacked, but in the meantime, I feel that fiction gives me the vehicle to tell what I perceive as the truth, only through fiction I get to hook into fast-paced thrillers which makes it easier for the reader to learn something while enjoying a good read. According to your website, you wrote the memoir A Beirut Heart: A Woman’s War as a project for your children. What made you want to write the novels Damascus Street and the first book The Syrian? Yes, I began writing A Beirut Heart for my children, but I soon discovered that it was also a way to mourn my loss of a city I loved. Although I didn't know it at the time, I was also discovering a way to combat what came to be called PTSD. For a very long time, I could not even read sections of A Beirut Heart without crying. Over the years I have gotten better but the trauma of war never disappears. On the upside, the experience of war has not only defined my life, it has driven my motivation to better understand the destructive forces of conflict across the Middle East and to place blame where I know it belongs. The trilogy which includes, to date, The Syrian and Damascus Street, centers on regime change in Syria. The characters involved in carrying out the West's agenda, and those willing to risk their lives to stop such an atrocity, are the people I want to see rule our world. I know for a fact that our mass media has distorted the news coming out of Syria, and I took it as a challenge to refute those reports and incorporate more accurately what is really going on in the region. On your website, you explain how it was frustrating before you wrote your memoir that when you wanted to tell stories about your time living in Beirut during civil war, no one seemed to want to listen. Have people approached you since you started writing your books to share any of their stories relating to the Lebanon Civil War? I did find it frustrating and at times hurtful when no one initially wanted to hear me talk about my life in Beirut during the war. Once A Beirut Heart was published attitudes changed. People's aversion to things they can't comprehend is part of human nature. I also attribute that attitude to the fact that we as a country have never had to face the challenges of a war. A conflict far from home enables us to "turn it off" and pay it scant attention. When we are confronted with someone who actually lived through one of those wars, it disrupts our complacent lives and makes us uncomfortable. State-side, no one has approached me about their own Beirut stories, but in Beirut, among my friends, we often reminisce about the years we shared together and that forever changed our lives. What do you hope the readers will take from this book? I hope my readers will better understand the West's intervention in Syria and the motivations behind such destruction and upheaval. I also hope readers will realize mass media oftentimes, with its close affiliation with the military, industrial complex, has a political agenda in promoting war. Remember Iraq and the weapons of mass destruction lies!